We all want that Hollywood smile with big, white and shiny teeth. But most of us live in the real world filled with teeth staining necessities like coffee, tea, soda and maybe an occasional glass of merlot. So what do we normal folks do to get that Hollywood smile? Having a beautiful smile may be even easier than you think. Many people achieve the look they’ve been dreaming of with our simple bleaching procedures. In this month’s blog we explain how teeth whitening works, when to bleach, the available options, and teeth sensitivity. How does teeth whitening (bleaching) work? 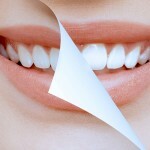 To understand how teeth whitening works, one has to understand how teeth become discolored. There are two types of discoloration: extrinsic and intrinsic. Your normal teeth brushing with whitening toothpaste will help remove the daily extrinsic stains (think surface staining) left from coffee, tea and red wine. Intrinsic (below the enamel) staining is caused by years of exposure to these staining substances and is harder to change. 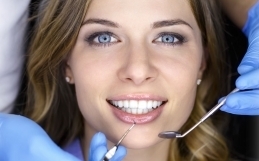 Teeth whitening will unfortunately not work on any teeth with dental bonding or crowns. First we take an impression of your teeth, then in only a day or two your custom bleach splints will be ready for you to pick up. We provide you with a special bleaching agent that you put into the clear splints. With only a few hours of wear per day, our special bleaching agent bubbles stains right out of your enamel in a very short time without altering tooth structure or existing dental work in any way. When your teeth reach the desired brightness, only occasional treatment is needed to maintain your new smile. So how do teeth whitening agents get the stains out from “inside” your tooth? Most whitening gels (or sometimes called bleaching agents) contain an oxidizing agent in the form of carbamide peroxide or hydrogen peroxide. These ingredients are the active ingredient in most whitening agents. The gel reacts with the internal aspect of your tooth, mixes with the discolored areas, and breaks them apart making them appear whiter! We use a brand of whitening products called Kor Whitening. More information can be found on their website http://www.korwhitening.com. 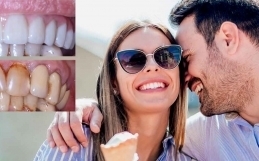 If you are having dental work done to your front teeth, you would typically bleach first, then once you reach your desired shade, wait one week to allow them to stabilize before having dental work done. Have a wedding coming up? Whiten at least one month before the big day! The most effective bleaching system offered. You will receive custom bleaching trays and begin at home 14 days prior to your appointment. Then, the hygienist will bleach your teeth during a 2 hour session. A great option for sensitive teeth. Begin using custom bleaching trays at home 3 days prior to your appointment. Then, the hygienist uses a laser light and bleaching product to produce a result sure to impress. Use custom bleaching trays along with our bleaching product each night that result in dramatically whiter teeth. A great affordable option for those who prefer to bleach on their own schedule. My teeth are sensitive when I bleach! If you have traditionally had sensitive teeth, use a desensitizing toothpaste containing potassium nitrate (Sensodyne, Crest Sensi relief, etc.) for at least one month before whitening. Also tell your dentist if you are having sensitivity, as he or she may be able to lower the percentage concentration of the whitening product. If you want whiter teeth, know that you have many options. There is no one best option for all, so give us a call and find out which product will work best for you.